Since I was a child I’ve had a “thing” about making sure that the curtains, blinds and/or shades are drawn COMPLETELY at night. I realize that during the day it is more difficult to see inside a window without being really close, so the only place I have allowed to be uncovered in our house are the three panes by the front door. Well, truth be told, I had a custom cut paper blind hanging over it for several years. I couldn’t stand it so I took it down but have waited 3 more years to solve the problem! I was not comfortable napping in the front room alone, doing yoga, and definitely NOT nursing… Until now. 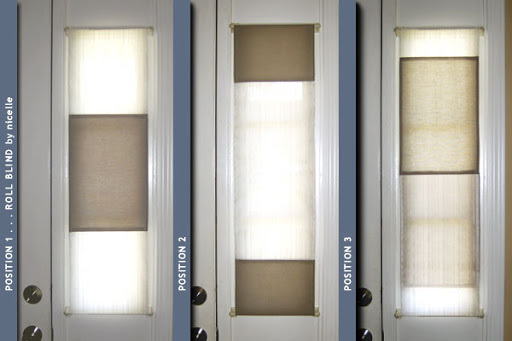 * create a “roll blind” that wraps the rod to have both the white semi-transparent fabric and the solid linen beige color! Here is what I came up with. You’ll see there are different positions that you can “set” the Roll Blind to, depending on your needs, or mood. Sorry, folks. I still have one window left before I can quit the elite group “PBLUFO5YC” (that’s Paper Blinds Left Up For Over 5 Years Club).